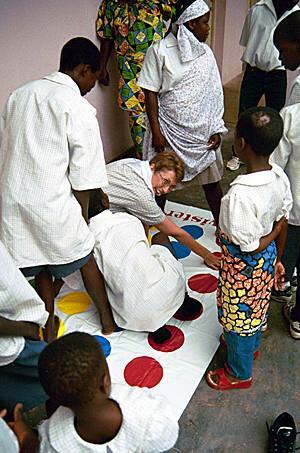 Melba Whitaker teaches children at the orphanage at Malange's Central United Methodist Church how to play the game Twister, which she brought with her from the United States. Please join us for a luncheon to celebrate our ministry in East Angola and the ground-braking role of Mrs. Melba Whitaker in this partnership. The relationship between the East Angola Conference and the Florida Conference of the United Methodist Church officially began when a Florida team traveled to Angola in January of 2003. Melba Whitaker, wife of Bishop Timothy W. Whitaker, and the Rev. Dr. Geraldine McClellan, were part of that first conference team that visited Angola on a fact-finding and relationship-building trip. Nine years later, the relationship between Florida and East Angola is going stronger than ever. Florida is investing in education and leadership development in East Angola through supporting the feeding program for the children in the Quessua Orphanage and providing scholarships for students at the Quessua High School and Seminary. With scholarships from the Florida Conference, three graduates from Quessua are already involved in higher education institutions to pursue degrees that will help them serve and develop the United Methodist Church in East Angola. Our conference also supports missionaries Leonardo and Cleivy Garcia, from the Methodist Church in Cuba. Our sustained investment in education and leadership formation is securing the future of the church in East Angola. As Bishop Whitaker and Melba Whitaker retire at this Annual Conference event, we want to honor Melba for her role in the ministry with East Angola. Please join us for this special occasion on June 14, Noon—1:30 PM, at The Florida Conference Bldg., 450 Martin Luther King Jr. Ave., Lakeland – Conference Room, 3rd floor. Luncheon cost per person is $10. Click here to RSVP. Reservation Deadline is June 8, 2012.